Root Canal Treatment is the field of dentistry concerned with the prevention, diagnosis and treatment of disorders of the dental pulp. Years ago, teeth with diseased or injured pulps were extracted. Today, root canal treatment gives dentists a safe and effective means of saving teeth. The pulp is made up of nerves, blood vessels, and connective tissue, which are important in tooth development. There are very small canals within your tooth and they can become infected quite easily. This causes the pulp inside your tooth to become infected as well. Pain and swelling may accompany the infection. Even in the absence of pain, certain by-products of a diseased pulp can injure the bone that anchors your tooth in the jaw. Our endodontists , who are dental specialist in root canal treatment, will remove this infection by performing a root canal procedure. This is one of the safest and most effective methods of saving a damaged tooth. In most cases, a root canal treatment involves a relatively simple procedure with little or no discomfort and can be completed between one to three visits. Best of all, it can save your natural tooth and your precious smile! At Bangkok Smile MALO CLINIC, we believe that nothing can compare to what nature has provided us with, and so we do our best to be able to preserve your natural teeth. We have outstanding endodontists who will take good care of any unhealthy tooth, and restore it to its healthiest condition. Treatment often involves from one to three visits. 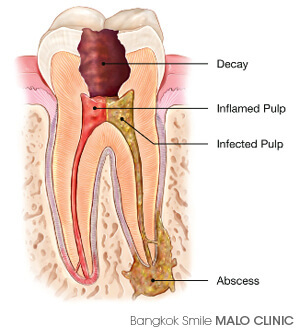 During treatment, our endodontist (a dentist who specializes in problems of the pulp) removes the diseased pulp. The pulp chamber and root canal(s) of the tooth are then cleaned and sealed. The root canal procedure should relieve the pain you feel. Until your root canal procedure is completely finished โ€“ that is to say, the permanent filling is in place and/or the crown is place, it's wise to minimize chewing on the tooth under repair. This step will help avoid recontamination of the interior of the tooth and also may prevent a fragile tooth from breaking before the tooth can be fully restored. For the first few days following the completion of treatment, the tooth may feel sensitive due to natural tissue inflammation, especially if there was pain or infection before the procedure. This sensitivity or discomfort usually can be controlled with over-the-counter analgesics such as paracetamol, ibuprofen or naproxen. Most patients can return to their normal activities the next day. As far as oral health care is concerned, brush and floss as you regularly would and see your dentist at normally scheduled intervals. Because the final step of the root canal procedure is application of a restoration such as a crown or a filling, it will not be obvious to onlookers that a root canal was performed. 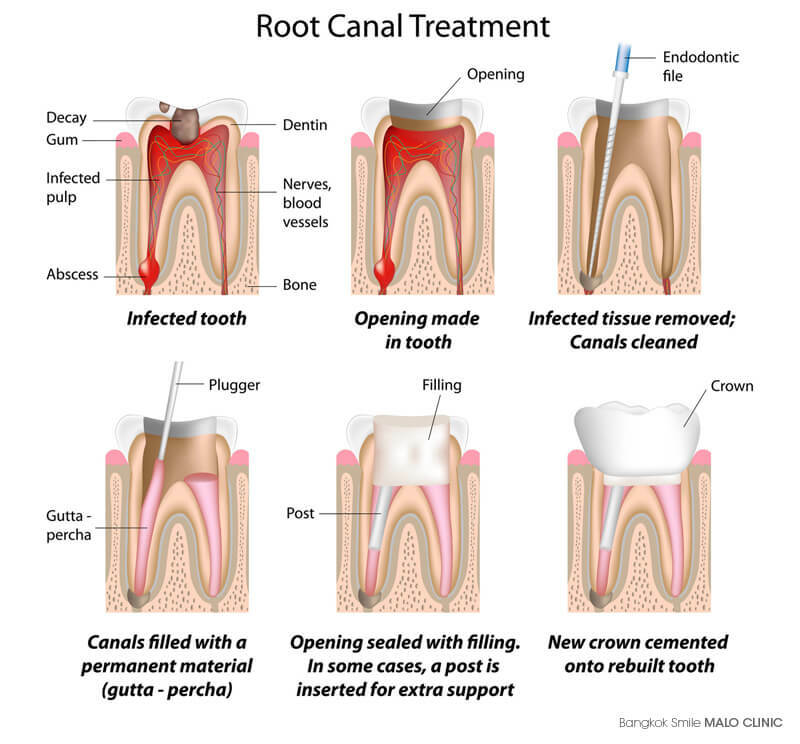 Root canal treatment is highly successful; the procedure has more than a 95% success rate. Many teeth fixed with a root canal can last a lifetime. After having root canal you can expect to have some discomfort for the first 12 hours or so. This is a normal occurrence and is nothing to worry about. This is caused by the dentist working onย the tooth and it should feel normal by the next day. If you find that you are still having pain and it seems to be getting worse or you notice any swelling starting please call the office right away. You may have a medicine taste in your mouth at first because a medication has been placed in the canal and you will notice that a temporary filling has been placed in the tooth. Try to stay away from sticky food but in the event that you lose the filling please call to have it replaced so that food and other debris doesnโ€t get down into the canal and cause reinfection. Any infection will only get worse with time, if left untreated. The greatest advantage is that the tooth will not need to be extracted in the future. Occasionally, infected tissue is pushed through the ends of the root infecting the gum. This can be treated easily, but there will be some pain until the infection is cleared up. Canals are irregularly shaped, and if the canal is not accurately measured then it wonโ€t be cleaned or filled properly. This will cause the pulp to become infected again and a second procedure will be necessary.